Our strengths are in quality and custom designed memorials, skills that are in short supply in today's monument industry. We understand honoring a loved one is an important decision. With personal attention to every detail our craftsman will create a lasting memorial for you and your family. From design to delivery let Carroll Memorials create a work of art for you. 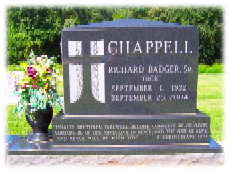 We have cremation urns, cremation memorials, grave markers, grave monuments and much more. Please contact us to learn more about the products that we offer. It's The Unseen Value That Really Counts! You may be interested in learning the definitions of the rather unique terminology associated with cremation. Cremation Memorials are named columbariums. Columbariums are made by combining multiple niches that will hold one or two urns of cremains. Cremains are the cremated ashes of a loved one. Please feel free to view our newly expanded cremation memorial exhibit in our comfortable showroom.